Diagram shawin structurs in the human neck. The fower green shadit auries represent the maist common poseetion o the parathyroid glands, which are generally fower in nummer an situatit behind the lateral lobes o the thyroid gland (shadit orange). 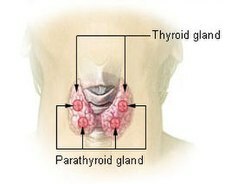 The parathyroid glands are smaa endocrine glands in the neck o humans an ither tetrapods that produce parathyroid hormone. This page wis last eeditit on 21 November 2015, at 16:41.